Jonathan Dowdall, a former close colleague of Mary Lou, is now helping the outgoing Lord Mayor of Dublin. 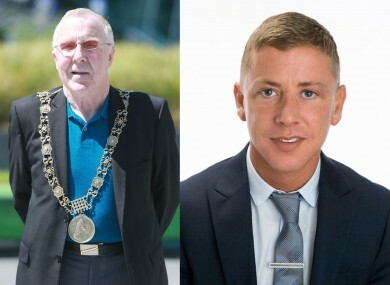 A FORMER SINN Féin councillor has joined Christy Burke’s campaign team as the outgoing Dublin Lord Mayor prepares his bid for the Dáil. Jonathan Dowdall is backing Burke’s bid for a seat in the same constituency as former colleague Mary Lou McDonald having quit Sinn Féin in somewhat mysterious circumstances earlier this year. As a former Sinn Féin activist and councillor himself, Burke is likely to be battling with McDonald for many of the same votes in the three-seat Dublin Central at the next election. Dowdall resigned from Dublin City Council in February after a long-running saga in which he initially backtracked on a decision to step down from his seat for health reasons last September. Dowdall then said he intended to quit Sinn Féin altogether after claiming a “small element” in the party in north inner city Dublin spread negative rumours about him. However, he then told TheJournal.ie last October that he was “delighted” to be remaining with Sinn Féin and said that the decision came after talks with party figures. Finally, the 34-year-old businessman quit his city council seat altogether in February and Sinn Féin has since co-opted Gaye Fagan to the seat. Burke, who quit Sinn Féin in 2009 just days after being elected, will finish his hugely successful term as Dublin’s Lord Mayor next Monday. It follows an eventful year which included being at the forefront of the Garth Brooks/Croke Park controversy. The significant boost in his profile means he is likely to pose a real threat to the existing TDs in the constituency and particularly McDonald. Neither Dowdall nor Burke returned a request for comment. Email “Christy Burke's bid for the Dáil just got a big boost ”. Feedback on “Christy Burke's bid for the Dáil just got a big boost ”.